The 2 Rand gold coin was minted by the South African government, together with its other denomination of 1 Rand, between 1961 and 1983. From that year on, these denominations were only minted by using silver as precious metal. These coins were replaced by smaller versions of the Krugerrand, like the 1/10 oz. Krugerrand for the 1 Rand gold coin and the 1/4 oz. for the 2 Rand denomination. These South African gold coins have 91.70% fineness and the gold used in the manufacturing process of a coin weighs 7.322 grams. The overall weight of a 2 Rand gold coin is 7.988 grams with a 22 mm diameter and 1.83 mm thickness. When these gold coins, like the 2 Rand gold coins, were issued South Africa had already a long tradition regarding the issuing of gold coins which continues until today. The most popular of all being the Krugerrand, a coin with high circulation around the world. 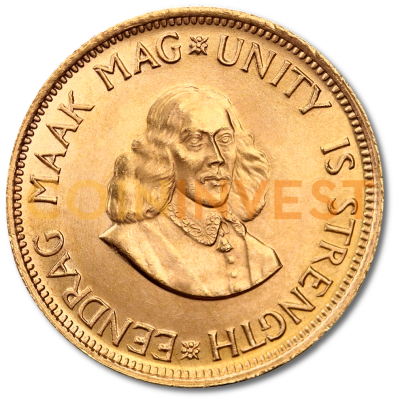 The obverse of the 2 Rand gold coin depicts the full front portrait of Jan van Riebeeck who founded the first Dutch settlements in Africa and is also the founder of Cape Town. 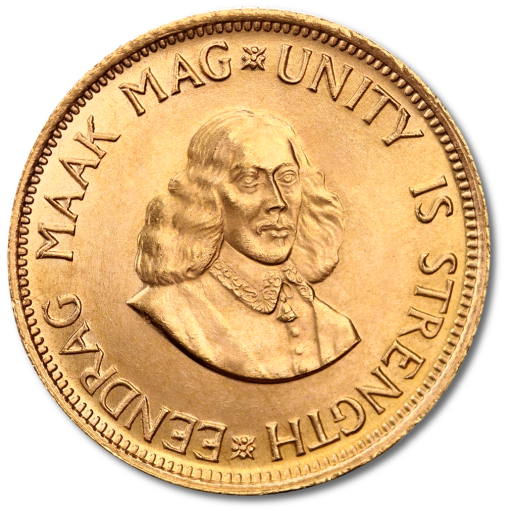 The inscriptions read: “EENDRAG MAAK MAG" (“Unity is strength" in Afrikaans) and its English translation “UNITY IS STRENGTH". The reverse of the 2 Rand gold coin was in fact designed for the South African 5 Shilling but ended being used as an design for the Rand gold coins. It was designed by Coert Steynbergs and depicts a springbok. At the top is the minting year, in our case 1962, and at the bottom the face value “2 R" (2 Rand). The inscriptions are: “SUID-AFRIKA" (the Afrikaans word for South Africa) and its English translation “SOUTH AFRICA". The design of the 2 Rand gold coin is the same as the one of the 1 Rand, only differing by the denomination inscribed on the reverse. The 2 Rand gold coin belongs to the category of affordable coins for investors and collectors because they have a small premium added to the gold spot price. This premium could increase in the future if demand is spiked by collectors and investors. And this could be the case taking into consideration that so many people are now preferring investing into gold. Any gold coin, including the 2 Rand gold coin, will offer people a feeling of safety. They can be sure that in case of currencies devaluation or inflation they have in their possession the right instrument that will allow them to nicely get through hard times. The 2 Rand gold coin is an international well known coin that should raise the interest of any collector or investor and it is also a coin appropriate for a person with not so much capital at the beginning of the road of gold bullion investment.